The Clareman returns for a fifth season with the Dubs. ANTHONY DALY ADMITS that he had to seriously think about his future after last season’s disappointment with Dublin’s hurlers. And the Clareman said he looked for the backing of his panel before committing to another season on the sidelines at Parnell Park. “I was very disappointed the way things finished up. It takes you a bit of time to get over it and that kind of thing,” the All-Ireland-winning skipper said of a season which saw the Dubs relegated in the league and under-perform throughout the summer. “Then you have four seasons done so you’re saying, ‘Is it time to go away and let someone at it’. I suppose with a bit of time and being anxious that the players would have a meeting, you know, kind of wanted to know if the players wanted to change,” he says. “If they wanted a change…we’ve seen too many of those things over the last 10 years, players not wanting managers and if I thought that was the case I would have walked away with no bad feeling to anyone. Daly – speaking at the Croke Park launch of the hurling league campaign yesterday ahead of Dublin’s opener with Offaly on Saturday — adds he wasn’t worried that the players didn’t want him. “I didn’t really, the night in Ennis we only had one drink, the boys were going back on the bus. They were to a man nearly saying, ‘Jeez, don’t make any decisions, wait’. So like, in fairness, I did feel they would (want me back). With a summer, two months to think about it, it was maybe, ‘Get someone new, someone with a fresh voice’. Daly’s also recruited a familiar face from the Banner County; former All Star forward, Tony Griffin. “Griff moved to Dublin last year,” Daly said. “I was anxious maybe to get him to throw in his lot as a possible player. But then he decided he was quitting club and everything. He was playing great club hurling for Ballyea, he was really flying. I just approached him this year about maybe coming in on board, and maybe doing a bit of training with us, helping out. “He has an awful lot of life experience and his charity is absolutely thriving. I was just anxious that he’d be a very good man to have around the place. A title for him? I don’t know what you’d call him. He’s away a lot. He’s going away to Australia now on Saturday for two and a half weeks. Tony doesn’t be there every night but when he’s there he trains with the lads. He’s built up a relationship with the lads. Maybe one or two of the lads maybe need a bit of mentoring here and there. Email “Dublin hurling boss Anthony Daly glad to get back to the drawing board ”. 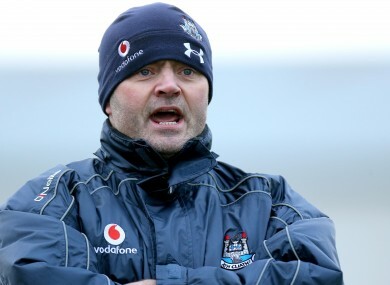 Feedback on “Dublin hurling boss Anthony Daly glad to get back to the drawing board ”.